In an effort to ease congestion, the Arkansas Department of Transportation (ARDOT) is overseeing an $87 million expansion project on Interstate 630 in Little Rock. Work began in July, with an expected completion date of January 2020. "This project is important because in order for the Big Rock Interchange to fully function as it was designed, this section of I-630 must be widened," said ARDOT spokesperson Danny Straessle. "Now is the right time to do this project, because it's being funded by a temporary voter-approved half-cent sales tax program. We are halfway through the program, and as soon as project development allowed, this project was let to contract. "This is a major east-west corridor in Little Rock," Straessle added. "We have committed to keeping three lanes open in each direction during peak times weekdays. Lane closures are restricted to nights and weekends. Other than the fact the speed limit has been dropped by 10 miles per hour to 50, and there are a few lane shifts along the route, there shouldn't be much impact on the motoring public." As part of the plan, I-630 from University to Baptist Health at the Big Rock Interchange will expand from six lanes to eight. The construction will make space for commuters, to prevent bottlenecking as they approach the interstate. 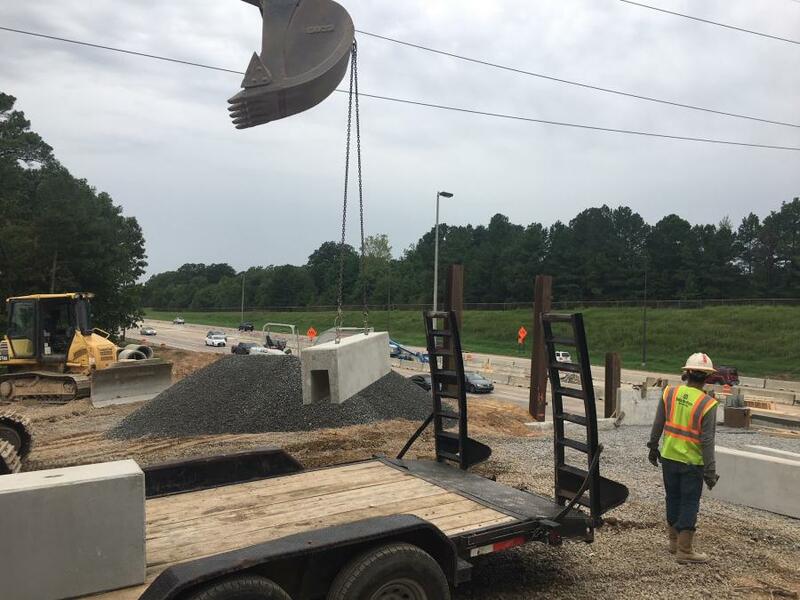 Early on, warning signs were placed along a three-mile stretch of I-630 in Pulaski County, preparing drivers for the changes ahead. Motorists commuting from west Little Rock to midtown or downtown were made aware that their regular routines would need to be adjusted. While three lanes on each side will remain open during the widening, some detours have been unavoidable. Manhattan Road & Bridge Company is serving as the general contractor for the 18-month project. Mark Windle, vice president of Manhattan's Arkansas operations, noted that while there are no significant construction method challenges, with the exception of a few complex shoring issues, the main concerns involve maintenance of traffic and scheduling complexity. "I-630 is utilized by 116,000 vehicles a day, serving the downtown commercial center of Little Rock and the state government," Windle said. "With the multiple stages of work required on this project, moving traffic safety and quickly through the project is critical. The need to move traffic safely through 2.16 miles of an urban highway requires a number of lane shifts, lane closures and detours to accommodate the construction of this project. "With such a number of work activities and functions and all of the moving parts progressing at a varied rate of production, scheduling was a challenge, but critical to the success of the project. Additionally, ARDOT required a complex scheduling system. The 12-week procurement timeframe prior to bid was required to produce an accurate schedule that incorporated over 5,000 line items and activities, multiple work schedules and numerous resources." For the crew, completing tasks efficiently is crucial. Windle said time is indeed money on the project. "ARDOT determined in the contract documents a road user cost for this project of $198,800 per day," he said. "A project of this size and complexity produces a number of risk factors to the contractor, but this road user cost posed the greatest risk. While an incentive of 15 days is possible, the disincentive is unlimited. With such a significant risk, the determination and progress of a total contract time was critical." Specifically, the contract provides for an early completion bonus of $198,000 per calendar day for 15 maximum days, or $2,982,000. However, if crews reach substantial completion after the 590 days bid, a $198,800 per calendar day disincentive is assessed against the firm, with no maximum, making the risk extraordinarily high for a later than bid completion time. The project currently has maintenance of traffic (MOT) work ongoing in the first stage, bridge work in the first and second stages, grading and drainage work in the first and second stages and traffic in the first stage of alignment. "The major work item at this stage of work has been the removal and subsequent reconstruction of the Hughes Street overpass," said Windle. "The bridge has been demolished, new bents 1 and 3 (end bents) are well under way, and the reconstruction of bent 2 (center bent in the middle of I-630) has been completed. "Hughes Street is the only overpass bridge removed and replaced. 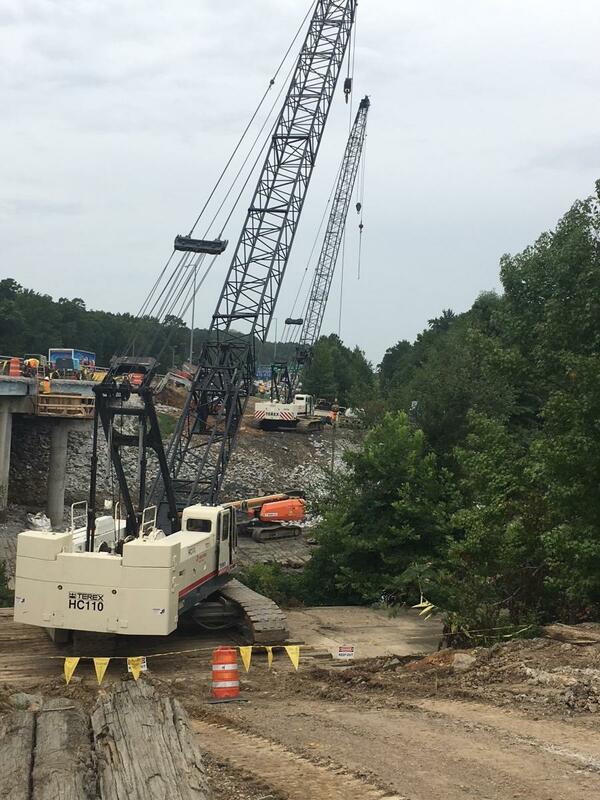 This reconstruction requires that Hughes Street bridge will be lengthened from 172 linear feet to 183 linear feet, with the new bridge using vertical MSE walled abutments, allowing more horizontal area for the widened roadway." The Hughes Street bridge replacement is well under way. 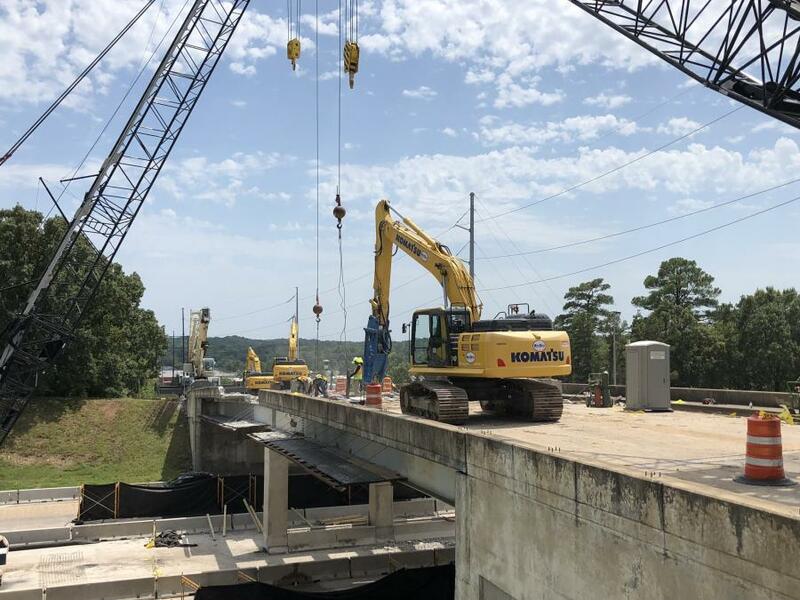 The new bridge deck was poured the week after Labor Day, and two more mainline bridges, Rock Creek and Rodney Parham, will be demolished in stages, widened and replaced. The work for these bridges will take place in Stages 3 and 4. "The Hughes Street overpass took less than three days to demo. It took another day or two to clean up debris, and move the steel superstructure to a salvage yard," said Windle. "The bridge was demolished using multiple excavator-mounted breakers, two cranes to lift off sections of the concrete deck and parapets, man lifts for installing and removing safety/debris shields, and other miscellaneous small tools and equipment. The critical issue was the protection and maintenance of traffic below the overpass, which was accomplished using multiple lane shifts and lane closures on a brief and periodic basis." 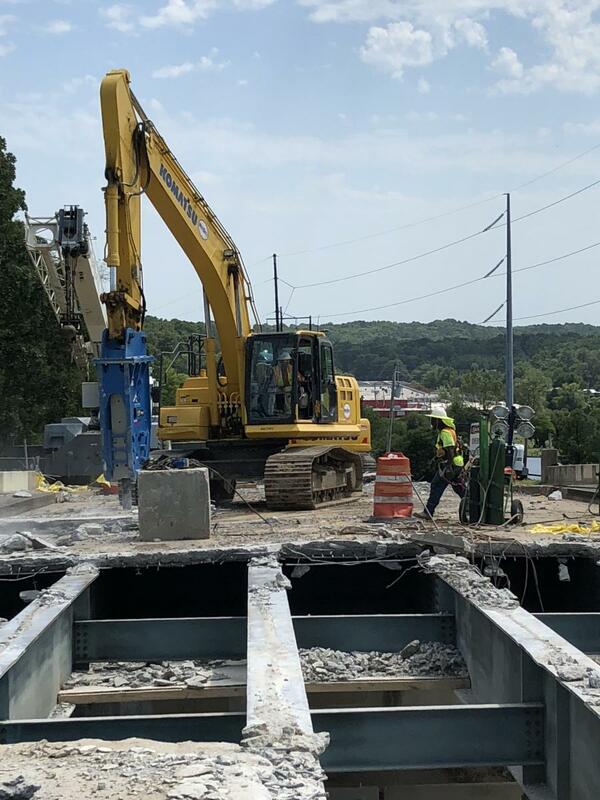 In addition to the Hughes Street overpass tear-down, crews have performed all the rumble strip and corrugation removal and repairs, most of the clearing and grubbing and deck reinforcement on the Rodney Parham bridge. Workers are keeping an eye on outdoor conditions, as they complete each task. "With this being a calendar-day project, every adverse weather day will affect progress," said Windle. "We did, of course, build a number of weather-related nonwork days into the schedule. However, since the weather adversely affects some functions of the project more than others, such as grading vs. bridge work, the schedule must constantly be reviewed and adjusted to reflect progress in the varied, but related, work items." Other significant tasks include the concrete paving/widening related to the bridge modifications, including shoring systems at Rock Creek and Rodney Parham and the detour grading and widening. Crews are dealing as best they can with the existing site, which is in typical condition for an approximately 45-year-old urban interstate highway. 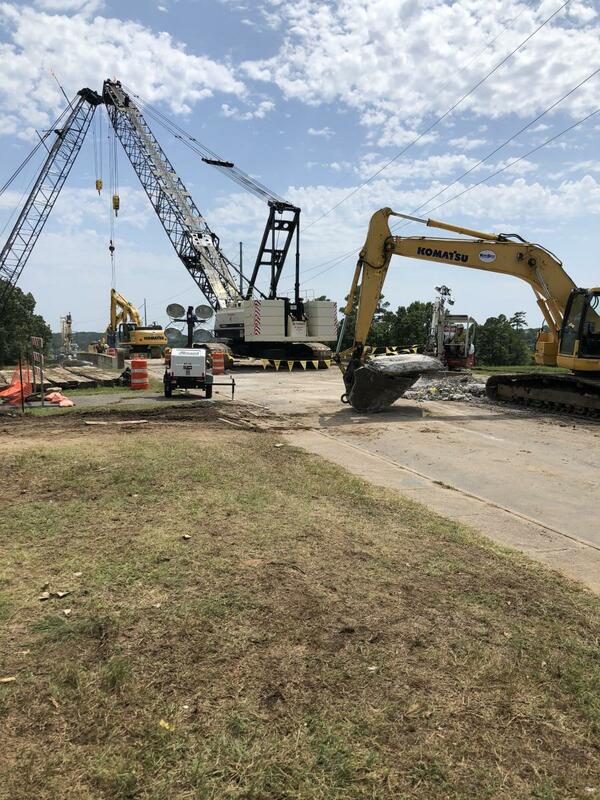 "We are seeing some deteriorated substructure components as we progress, but ARDOT and the Connecting Arkansas Program (CAP) program manager are working with us on repairs/solutions as we progress," said Windle, who added that excavation will not be a huge issue on the project. "Nothing extraordinary here. Due to tight working conditions and right of ways, we are utilizing mostly smaller-sized excavating equipment. With no massive quantities to deal with, we are able to move from area to area easily and efficiently, as our team executes in a number of different areas. "Most materials excavated on site are suitable for onsite embankments. We do have an area or two that we can use to stockpile excavated materials for use in future stages, and we have an offsite borrow site from an active pit that provides suitable borrow when required. Since the embankment requirements do not call for large quantities in any one area, we are able to utilize our smaller units very efficiently and productively, hauling with over-the-road dump trucks. Approximately 220,000 cu. yds. of dirt/material will be handled on the project. Workers are using more than 100 pieces of equipment to perform various tasks, including six cranes, two Terex HC 165s, two Terex HC 110s, a Terex HC 80, a Terex RT665 and 10 dozers — mostly Komatsu D39s and D51s, with a Cat D4, D5, and D6 — as well as 16 predominantly Komatsu excavators ranging from PC 240s to PC 290s, six loaders, various skid steers, six compactors and a number of forklifts and man lifts. Key materials used during construction include ready-mix concrete, aggregates from Granite Mountain Quarries (GMQ), precast drainage structures, reinforcing steel, MSE wall systems, steel bridge beams and girders and noise wall systems. The noise walls were designed for the north side of I-630, approximately located between North Rodney Parham Road and South McKinley Street. The walls were based on community support, and because of the advantages they have over noise soil berms, including greater noise reduction benefits, less maintenance and fewer impacts to public use of the right of way. The project has not been without controversy. An Arkansas attorney filed a temporary restraining order requesting the work be put on hold, arguing that the project did not qualify for an exception to federal rules requiring an assessment of environmental impact. In late July, however, a federal judge denied the plaintiffs' request to halt the project. No disruption of work has resulted as a result of the lawsuit. As crews move forward, keeping focused is key. "The most time-consuming and important part of our work involves maintenance of traffic, our schedule and our equipment. All of these are critical components, to ensure a safe work site," said Windle. "Worker safety and maintenance of traffic are the chief concerns. We have two safety engineers engaged with the project, with one on site during most shifts. We have safety briefings prior to every shift worked, and our crews adhere to corporate and job-specific safety programs relating to the various work functions we engage in daily." For the majority of the job, crews will work 10-hour shifts, day and night, six days a week. Sunday work will be required for several work items, such as the bridge demolitions. "We coordinate any lane closures or traffic changes required with the CAP program manager, Garver Engineering and ARDOT," said Windle. "ARDOT maintains its online traffic focus through the website IDriveArkansas.com. Also, ARDOT has a couple of live, onsite video feeds active 24/7/365 for the traveling public to watch the site conditions and progress." Three dozen projects comprise the $1.8 billion program, which was created to improve transportation connections between cities throughout the state, increase capacity by widening highways to move people and goods more efficiently and provide a revenue source for new highway projects. It was also established to accelerate the completion of highway improvement projects, to enhance traveler safety, support job growth and boost the state's economy. Determining factors for selection included estimated construction schedules and cost, as well as the need to widen two-lane highways to four-lanes in vital corridors, and pre-construction work already completed.